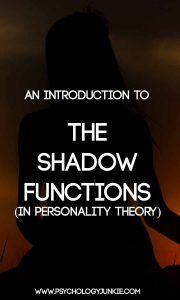 If you really want to dive deep into the more complex and rarely discussed aspects of personality type, then delving into the shadow functions can be a lot of great fun (and very helpful)! When you first took the Myers-Briggs® Type Indicator (or a similar online test) you were probably startled by how accurate your type description was (if you were typed correctly!). You might have learned about the dichotomies (like introversion and extroversion). You might have gone even further to study the cognitive functions (Fi, Fe, Ti, Te, Si, Se, Ni, Ne). For most people, the study of personality type ends at the cognitive functions, particularly the primary function stack. What else can you learn, after all? The truth is, there’s quite a bit more about type that can greatly impact your life and improve your relationships with people. What’s a Primary Function Stack? If your head feels like it’s exploding now, don’t worry. We’ll explain this all step-by-step through the rest of this post. Why Do the Shadow Functions Have Such Weird Names? 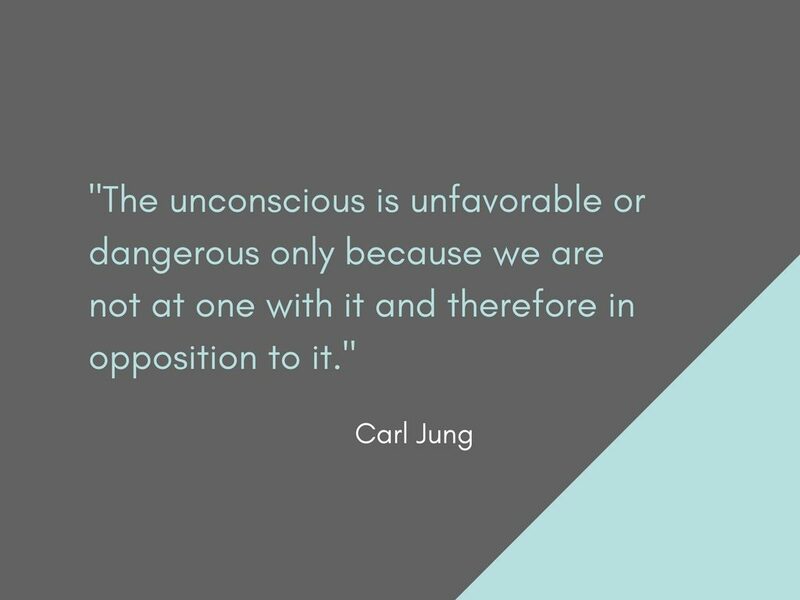 According to Jung, the “shadow” lies at the edge of our conscious and unconscious psyche. It is the dark, unlived, and repressed side of the self. It contains repressed memories, primitive, negative, or socially depreciated human emotions and impulses. Usually what we deem as unrelatable or “uncouth” becomes part of the shadow. It lies in opposition to our ego. Our ego is what we imagine ourselves to be, it’s our conceived “identity”. According to typologists, our dominant and auxiliary functions lie at the core of our ego and gradually as we develop our tertiary and inferior functions, they too become part of the ego. Functions that are not part of our primary function stack are left in “the shadow” and come in and out of consciousness as a way of protecting the ego when it’s not doing a good enough job on its own. It’s important to remember that the ego, while important, isn’t always “truthful”. We may discard uncomfortable truths if they don’t line up with our idealized “image” of ourselves. As a result, our ego tends to be a combination of carefully selected qualities, and unfavorable qualities that could make us feel bad about ourselves are often discarded into the unconscious. Are the Shadow Functions Good or Bad? Both! Shadow functions can be highly destructive or a catalyst for growth and self-actualization. Their main goal is to stabilize us and prevent ego inflation and disruption of the ego from threats to our integrity. Our shadow will impact us when we are experiencing extreme stress and our normal “tools” fall short of handling our stressors. These are those times when we wonder why we’re acting strangely and out-of-character or in ways we don’t really identify with. The shadow can also “step in” when we become ego-inflated and need to have a “reality check” of our weaknesses. 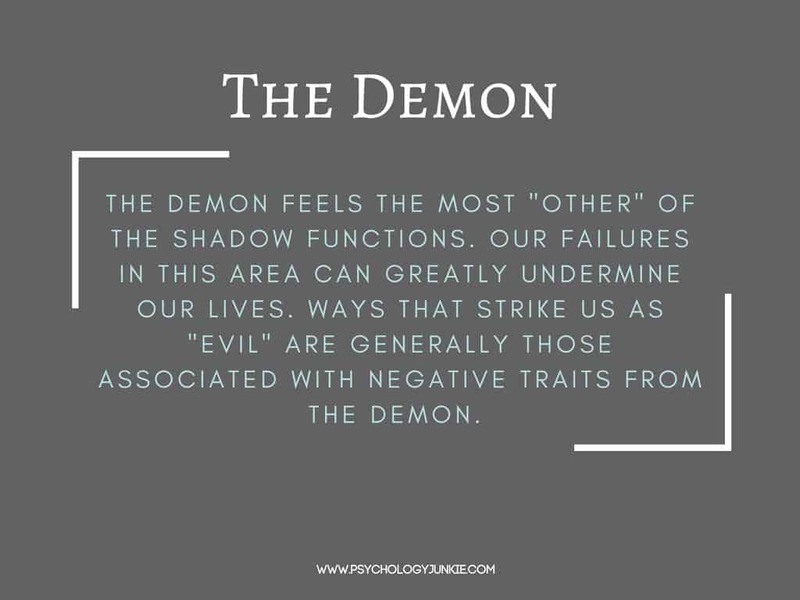 The shadow functions can be negative because we don’t have conscious control over them, and when we are impacted by them we tend to behave in irrational, unreasonable, or morally ambiguous ways. We may also project their negative aspects onto other people. To understand the shadow functions accurately, we need to understand the primary functions as well. We’re going to go over all 8 functions starting with the dominant, then the inferior (because these make up the “spine” of your ego). Then we will discuss the auxiliary and tertiary function (the “arms” of the ego). You can see an example of this in the graphic below. This function is at the core of your ego and is your most easy to develop and control. Understanding and differentiating your dominant function is an important part of self-actualization. 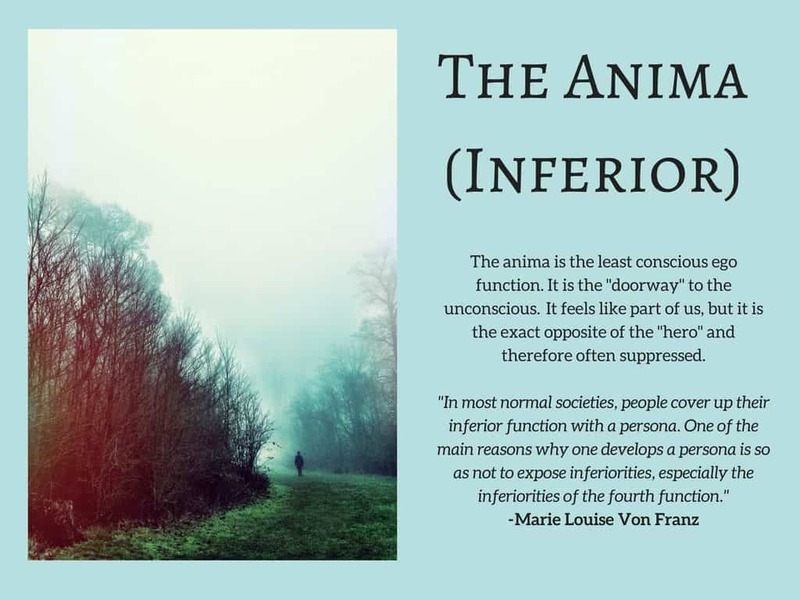 The inferior function is intrinsically linked to the dominant function. It is one of the last functions to become assimilated into the ego, and it’s also one of our weakest functions. We often suppress this function or try to hide it because we know we can’t wield it effectively most of the time. It is often a source of shame and it may take a great deal of time before we feel comfortable using it consciously. We tend to admire people who use this function well, but personally we often find using this function “a waste of time”. Healthy development of the dominant function relies on some healthy development of the inferior function. People who suppress the inferior function for most of their lives become one-sided, imbalanced, and unhealthy. The auxiliary or “mother/father” function supports us and others and promotes growth. This function helps to balance our dominant function and it also is what we use when we comfort and nurture others. The tertiary or “child” function is one that we often wield in a playful, exploratory, creative way. The tertiary function is often called the “relief” function by typologists and that’s because we can enjoy using it to relax, calm down, and take pressure off of our often overused dominant or auxiliary functions. The child function is also how we like to be comforted many times (but not necessarily always). For example, if your tertiary function is extraverted feeling (Fe), you might want to be comforted by receiving empathy, affirmation, and harmonious acceptance. If your tertiary function is introverted sensing (Si), you might want to be comforted by receiving consistent, practical dedication and by having reminders of ways you’ve succeeded in the past or good memories from the past. That covers the primary functions and how we use them, so now let’s move onto the shadow functions! 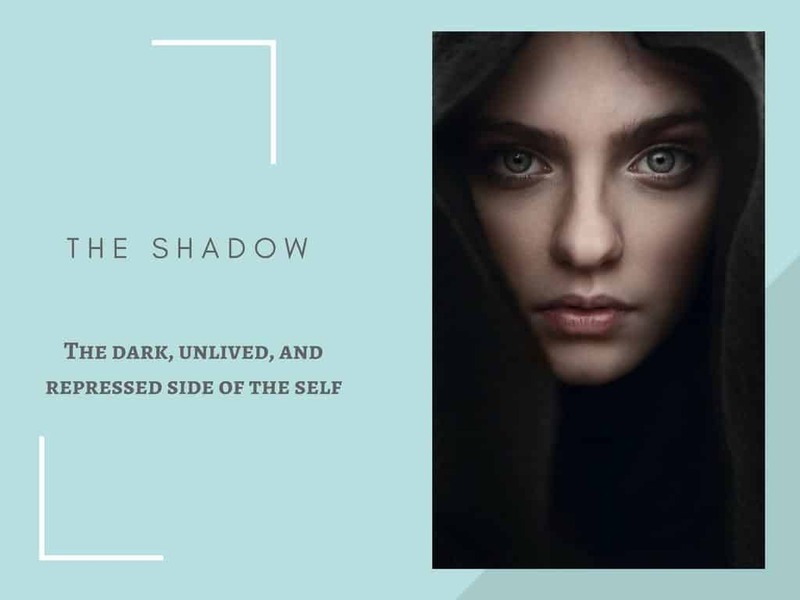 Remember, you often aren’t aware when you’re using the shadow functions, or when you’re projecting them onto other people, so it may take some time and conscious awareness to see these archetypes in use. 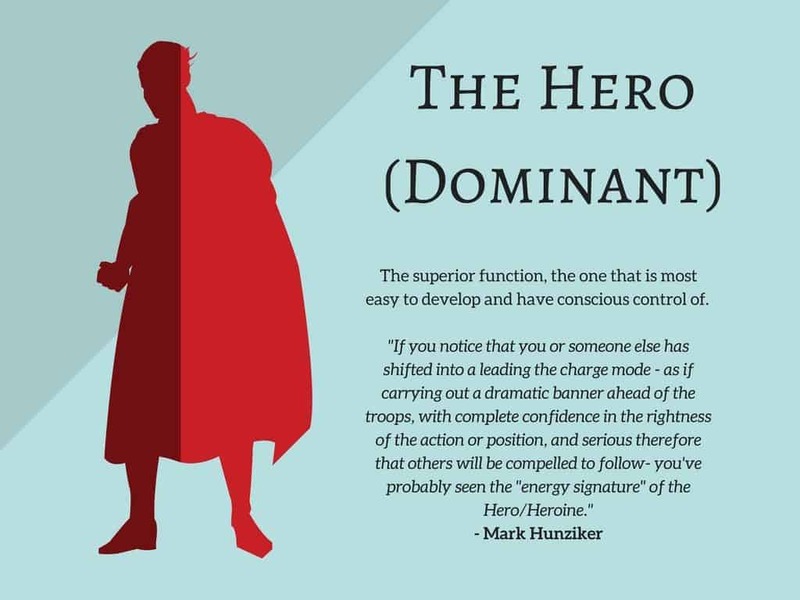 If you think of the dominant function as your “hero”, then you can imagine the opposing role as the snarky, would-be usurper to the hero. The opposing role “shadows” your dominant function, calling out doubts, opposition, and passive-aggressive remarks. The opposing role may cause you to doubt your dominant function’s goals or viewpoints. It also may be what you use when you become argumentative or lash out at someone or something that feels threatening to your ego. The opposing role is also extremely easy for us to project onto other people. Because our experience with that function is largely negative, when other people use that same function (even in a positive way) we can risk seeing them as being oppositional, passive-aggressive, or having hidden motives. Example: If you’re a Fi-dominant personality type (IXFP) then Fe would be your opposing role. You might see Fe-users as somewhat oppositional to you from time to time. 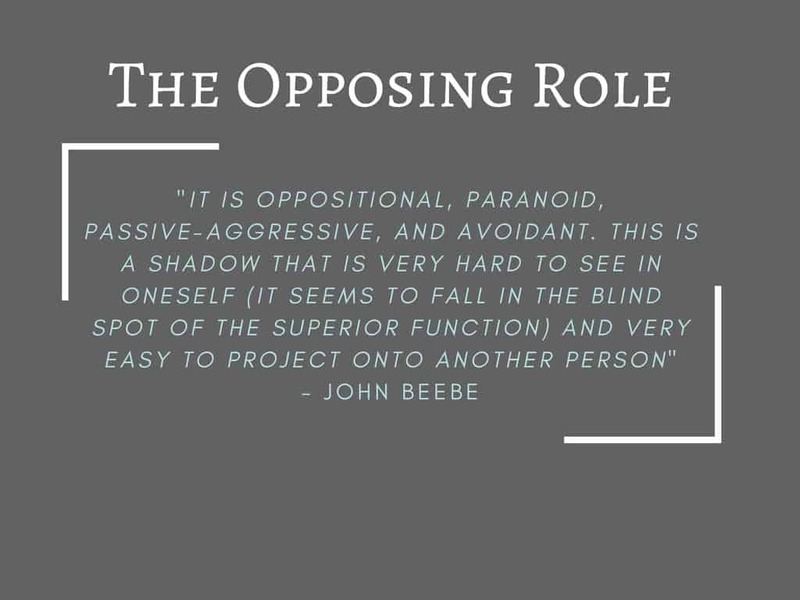 You might project the opposing role onto them (and them onto you if they lead with Fe) and may feel at times that they are undermining or have hidden motives. They might project the same negative traits onto you. Alternatively, you might experience Fe as an oppositional voice in your head that defies your dominant Fi. 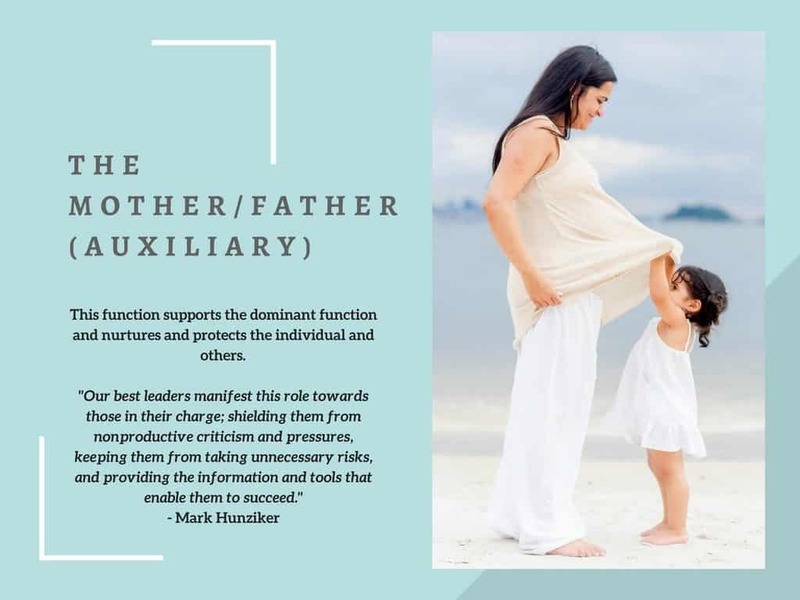 The critical parent function shadows the auxiliary mother/father function. 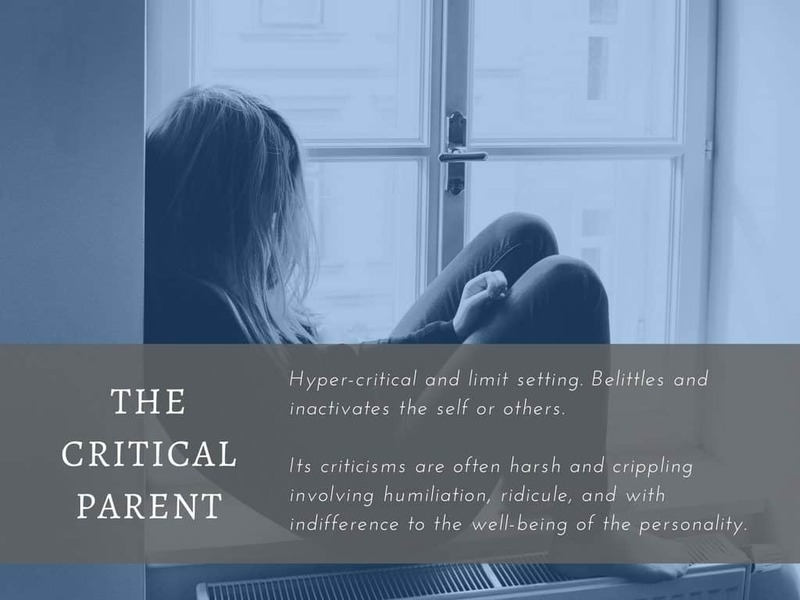 In contrast to the “parental” second function that nurtures and protects, the critical parent belittles, inactivates, and humiliates. It calls out our shortcomings and failures and rejects our ideas. This function can be directed inwards towards our ego, or directed or projected at others. Sometimes when we see someone being, in our view, “childish” we take on this critical role. When someone is triggering our “trickster” function (the 7th function in our stack) we might react by taking on the “critical parent/witch” role to try to control them. Example: If you’re an EXTP and Ti is in your auxiliary position, then Te would fill your “critical parent” role. When you feel like someone’s being childish and immature you might become critical of their objective logic, their organization, their planning abilities. You might try to organize or delegate to them and may become more “commanding” and critical than is typical for your usual easy-going self. Alternatively, when you are feeling stressed or your ego feels threatened you might experience Te as a contrary inner voice that criticizes your plans, your ability to “get things done” and your life’s work. The trickster shadows the tertiary “eternal child” function. In contrast to the innocent, vulnerable, and playful “child”, the trickster is sly, malicious, shape-shifting, and deceptive. He is both good and bad. 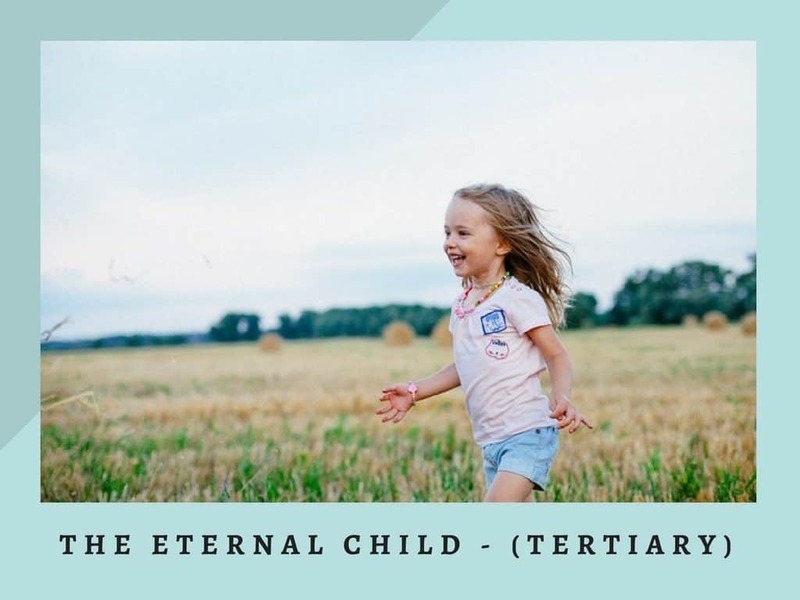 He is determined to protect “the eternal child” from attacks from other people, but he can also create so much chaos in the process that conflict arises in a relationship or the self. Using the trickster function feels uncomfortable, confusing, and disquieting. When using this function we tend to “trap” people in double-binds. We may find that we’re disrespecting rules or boundaries or being manipulative in ways that don’t feel “right” or relatable to us. 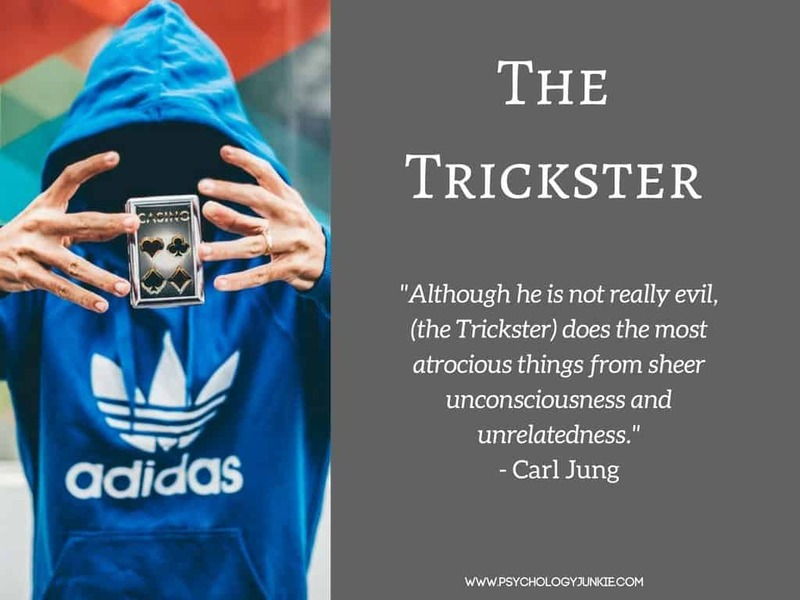 The Trickster sounds very negative, but is actually an important catalyst for growth and individuation. Example: If you’re an IXTJ and Fe is in your trickster position, you might see demonstrations of Fe as “childish” or “manipulative”. Alternatively, when someone is being excessively critical with you and causing ego disintegration, you might lash out at them using Fe in a manipulative, underhanded way to “trap” them in a double bind or lose-lose situation. The demon is essentially our inferior’s inferior function. It feels the most “other” of all our functions and our failures in this area tend to be the most undermining. We may struggle with relating to people who use this function in the dominant position, because our experiences with it are so negative and because we don’t connect with it consciously except in very rare, disquieting cases. We may project “the demon” onto other people who are using this function in an obvious way. It’s important to recognize when you’re projecting this function so you don’t misunderstand or demonize others for using a function in a normal/healthy way. Example: If you’re an EXFJ and you have Ti in the inferior position, than Te would fill the “demon” role in your function stack. As a result, you might initially bristle at demonstrations of Te. You might find yourself misunderstanding Te motives and seeing them as morally “evil” or “cruel”. Alternatively, when having to use Te you might feel completely out-of-your-element and unable to connect with your sense of self. You might use Te against yourself in moments of severe stress and ego disintegration. You might use poor/inarticulate forms of objective logic to undermine yourself and your goals and value. All this taken into account, Te can still be good for you. If you learn what it is, and start accepting it as part of your life, you can grow personally and sidestep its negative impacts. You may learn to respect and greatly admire people with strong use of Te. Do you agree with the theory of shadow functions? Disagree? Share your thoughts with other readers in the comments! This is great stuff! If there are 8 functions, why wouldn’t we all look into the ones that aren’t in our “primary stack”? Can someone give me a insight? I know for a 100% that I am INFP, but my environment forced me to stay on the grip of Extraverted Thinking for a very long time, so much that I think that I developed the “shadow” to the point it became a secondary personality(ESTJ).The functions of these two personalities are the same, what changes is the order of stacking. This is just something I thought, but is it possible to have two personalities? Is it possible to develop the “shadow” to the point the it becames a full personality? Can someone give me a insight? I know for a 100% that I am INFP, but my environment forced me to stay on the grip of Extraverted Thinking for a very long time, so much that I think that I developed the “shadow” to the point it became a secondary personality(ESTJ). Now, the functions of these two personalities are the same, what changes is the order of stacking. This is just something I thought, but is it possible to have two personalities? Is it possible to develop the “shadow” to the point the it becames a full personality?